I hesitate to call what generally happens to the weather in New Zealand in June, July, and August 'winter' because I hail from the Midwestern US and before that, from the snow belt in Ohio, but it does at least get chilly enough for sleeves. 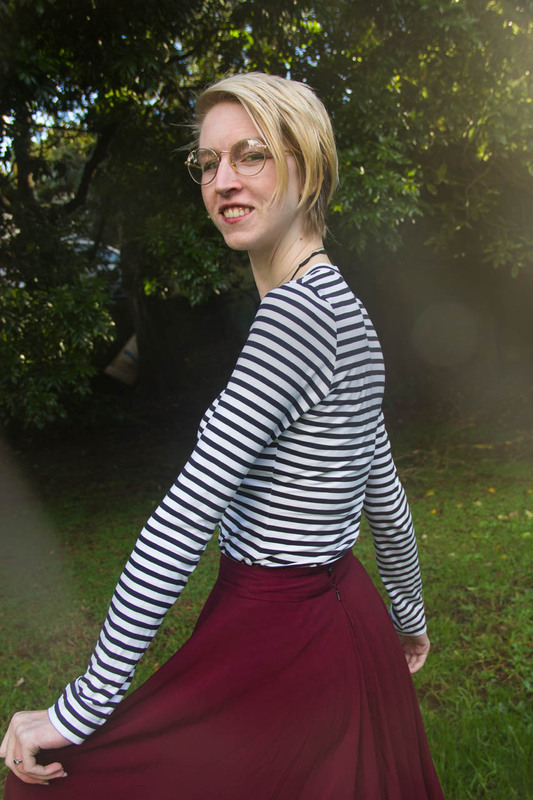 I swear I was just going to do quick patio photos for this shirt… but how could I resist MORE swishy skirt pictures!?! Both of these shirts are already staples in my wardrobe, and each took less than two hours to make. I used my T-Shirt draft for both, but I made some modifications to make each one fit a different purpose. I drew out a new long sleeve pattern that has the same armscye shape as my short sleeve, so it fits the armhole of my existing block. I based it on a combination of my arm measurements and the sleeve measurements of a long sleeved shirt that fits reasonably well. Here's my inspiration for the striped shirt. It's close fitting, long in the body, and has a deep scooped neck. I don't really have a lot to say about the construction, here - the most difficult part was swapping my normally-black serger thread for white. I almost forgot to take an un-tucked picture of this one before the scene change! (Okay, that's not entirely true, When I went to do the twin needle hemming, my machine threw a tantrum of skipped stitches. I tried everything to fix it and nothing worked, so it sat in the time-out pile for a while. When I went back to the project to try again a few days later, it magically worked on the first try. Sometimes, my old Elna just doesn't wanna, I guess. I don't blame her. Here's my inspiration for the second shirt. This one is made from merino I found in the $10 bin at The Fabric Store- it has a subtle eyelet pattern but I still think it's opaque enough to wear on its own. For this version, I cut the body wider towards the bottom (starting at about the bust line) - I also added about an inch of width to the sleeves, and made cuffs instead of a folded hem. I was going for a flowy, casual/cosy shirt that I could tie, but the distinct A-line shape (a result of the slight stiffness of the hem, I think) was a welcome surprise. For this version, I kept the the length at hip level and made a split hem using the same technique that worked so well for my succulent shirt. I'm intending to wear this one loose to show off its cool hem, but I'm also thinking I'll like to tie it up in a little bun-knot like the inspiration photo if I want to wear it with high waisted things. These were both super quick and easy projects, perfect when I needed a break from the more complex projects I'm working on right now - the first of which you'll see next week!